The point of this daytrip is to get on the train at Masaryk station, look out the window for 30min, arrive in Celakovice, walk around, eat, see history, and finally return to Prague on the train. In Čelákovice you will experience what life is like in a small town Czech. If you are interested in staying the night, I know of a B&B (Pension) you can stay at - more details at the bottom of this page. In 1918 Masaryk was the first president of the newly formed Czech Republic. Masaryk is also the name of the second-biggest and oldest train station in Prague. Since 1845 the Masaryk train station has been used mainly by locals. You will notice as soon as you walk through the large glass entrance there is no McDonald’s, there is no information desk, and you want to make sure to hold your nose if you need to use the washroom. Masaryk station is a hub between Prague and everything east of Prague. Instead of suburbs, the outskirts of Prague consist of small, self-contained towns. Each town has a mayor, church, center square, deli, and, of course, a favorite place for beer and goulash. Masaryk station is for people who work in Prague but have a small town as their home. By tram, metro, or walking, find the station—it is on the east side of Prague. Walk into the oldest station in Prague, and in front of you will be a crowd of people staring at a table of train times. Ignore that—it’s too complicated. Čelákovice is not the destination, so it will not show up on the table. Depending on the time and day, the destination changes, so to figure out which train you need to get on, you need to know the routes and destinations. Like I said—it’s too complicated. There are six tracks, but starting from the right, the odds are that the train to Čelákovice will be on one of the first three tracks. Four and five are both possible but unlikely. On weekdays the train you need to be on leaves every half hour. Presently, it leaves at :55 and :25. This could change by the time you are here, but only by a maximum of a few minutes—it might be :57 and :27. You are staring at the first three tracks and the time is :20. There is a train on each track, so which one do you choose? The final step is the most important but also the most difficult. You need to pronounce ‘Čelákovice’ well enough so that when you ask one of the people standing around, they know what you are saying. Say ‘Čelákovice’ and they will point to one of the trains. If they slap you, then next time write the name on a piece of paper and show it to them. If there is nobody around that looks pleasant enough to ask, there should be a train conductor in front of every waiting train who will gladly place you on the correct train. You will recognize the train conductors because they look exactly as you would imagine them to look. Now that you know which train to get on, go look for the ticket booth. Again, it’s best to ask because it is located in a completely unpredictable place. For completeness, here are the directions: looking at the trains, turn right and walk down a hallway; turn left at the end and walk all the way down the hallway. The ticket booths are on your left. You found the ticket booths—good. You need a return ticket to Čelákovice. Say ‘Čelákovice’ and ‘spatecni’ (return). It should cost between 80 and 100 CZK. With ticket in hand, find the train and get in. Depending on the time, you will either find a seat easily or you will have to stand—is it rush hour? The ride is just under 30 minutes. You will pass four stations before arriving in Čelákovice. It is impossible to miss your stop. A voice through the speakers advises what the next stop is, and there is a bright red LED sign indicating the current stop (if train is stopped) and the upcoming stop (if train is moving). Each train station has a large blue banner with the station name. Start paying attention after the 20-minute mark and you will be fine. The stops are Praha Masarykovo (start), Praha-Vysočany, Praha-Hor.Počernice, Zeleneč, and Čelákovice (end). As you look out the window and the buildings of Prague fade into grassy fields dotted with rabbits, you realize that you are heading where people do not speak English. At this point you might experience a slight tingle of fear. Let me reassure you, there is nothing to worry about. Czechs do not throw tourists into the river. They will help you if you need help. And no matter where you end up in the Czech Republic, you never have to worry about getting completely lost because all roads lead to Prague. Everybody knows how to get to Prague from where they currently are. So worry not. Be as carefree as the rabbit hunters you see out your window, guns over their shoulders, simply walking and enjoying. As you intently watch the hunter aim his gun at the bounding rabbit, you might be interrupted by a man in uniform. Sternly, he will reach out his hand. Give him your ticket. He will place your ticket on his ticket reader and, if all is well, stamp it and sign it with his initials. He will give you a nod and a smile as he moves to the next person. You look back—the rabbit is dead, rabbit goulash night. Čelákovice main road is in the shape of an L. When you get off the train and exit the station, you are standing at the top of the L. All the good stuff in Čelákovice is on the bottom, the horizontal part of the L. Walk down the main street until you are forced to turn left. Now you are where the action is. Fortunately, in Čelákovice you do not need to be on guard for tourist traps; odds are you are the only tourist. Feel free to enter any establishment and use a pointing finger to attain a snack at a deli or bakery. As you walk down Main Street, you will notice stores that resemble ‘dollar stores’ in that they sell everything from underwear to can openers. Stepping inside one of these stores, you will notice that the proprietor is of Asian descent. These are the Vietnamese, and they run the convenience stores in the Czech Republic. In the 1960s, under the approving eye of the USSR, the Czech Communist government got together with the Vietnamese Communist government and made an exchange. Czech sent Vietnam manufactured goods to assist with the war effort against America, and in return Vietnam sent citizens to Czech. Nobody is certain how this arrangement was supposed to benefit either party, but the USSR is not known to make decisions that improve lives. There are over 60,000 Vietnamese living in the Czech Republic, and they found themselves a niche. While most Czech-owned convenience stores are closed, the Vietnamese are open. Czechs close at 5 p.m.; Vietnamese stay open until 9 p.m.; Czechs are closed on Sunday; Vietnamese are open. They work hard, and for this reason, the Vietnamese have a good reputation and are respected in Czech. Find the main square—it has a fountain on one end and a stone-bed creek running through it. The large Communist-built building (you’ll recognize it instantly—only a Communist could create such an eyesore) is an international school for business. People visit from all around the world and live in Čelákovice attending classes at the CMC. That’s great for them; the benefit to you is that the two main restaurants have English versions of the menu. On both sides of the square are restaurants, and both have a Pilsner Urquell beer sign. Although both of them have fantastic food, the one called ‘BouCZECH’ at the foot of the CMC building has a patio right on the square. They also cook well, so sit there and order anything. Excavation has shown that Čelákovice has had stone structures since the 900s. The first mention of Čelákovice in a book is 1290. So just after the Crusades and around the time Ghengis Khan was wreaking havoc in the East, Čelákovice—sitting smack in the middle of Europe—was busting. From the square it is a five-minute walk to the church and the hub of late-medieval Čelákovice. 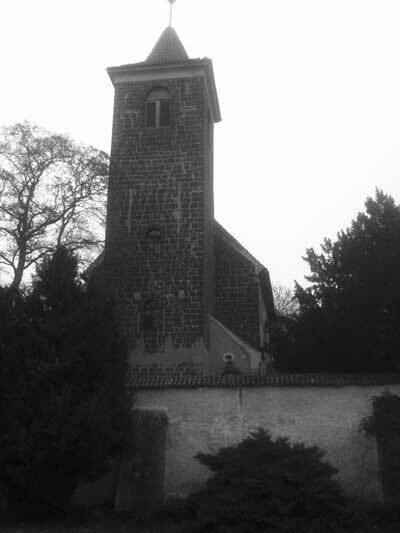 The stone church was built around 1300, perched on a small hill. You can imagine the families with their humble homes scattered under its shadow. They would fish in the river and hunt in the woods. Archeologists have discovered pots, jewelry, baskets, weapons, and even canoes. Wild boars roamed the forests and were a constant threat and source of food. Visiting this old church turns words in a history book to a real experience of how people lived. Somebody standing where you are standing was looking at that same church over 700 years ago. Besides barbarians, enemy armies, and wild boars, the citizens of Čelákovice had to worry about vampires. Čelákovice has the largest vampire graveyard in the world. In 1966 a homeowner on the outskirts of town needed to expand his house. Digging in his backyard, the shovel struck bone. Thinking it could be a recent murder victim, he called the authorities. Bone experts arrived and determined the skeleton was hundreds of years old, so they called an archeologist. To the homeowner’s dismay, his home expansion had to be put on hold until a full excavation could take place. Čelákovice in the 11th century was a religious and superstitious place. The church at the center of town attests to that, but more evidence is found in the way 11 skeletons were placed in the grave. Their hands and legs were tied, their heads were cut off, and rocks were placed on their bodies. The people who buried them were worried that theses 11 skeletons would return from the dead and attack them. Like they believed monsters existed in the sea, people believed that vampires existed in Europe. They also believed that if you killed a vampire, then you had to make sure it did not rise from the dead to kill you. Cut off their heads and hands then place rocks on their bodies to hold them firmly underground. As you walk around Čelákovice and look at the church, consider the fact that there existed a group of people who somehow killed 11 other people because they thought they were vampires. What did the 11 vampires do that was so terrible that they had to be killed and buried in such a manner? Imagine a group of people standing in an empty field, around an unconsecrated hole in the ground far from the holy church, under moonlight, cutting off heads, hands, and feet, and placing heavy rocks on the bodies. This humble church reminds one of how different an experience people had compared with ours. They worried about vampires; we worry about climate change. What will people looking at this church a thousand years from now worry about? After a few minutes of pondering this question, you might need to take a long walk along the river. The ‘Labe’ (Elbe) runs through Čelákovice and is only a few minutes from the church. Not that you should, but if you were to jump into the river, you would be carried with the current north through Germany and tossed into the North Sea. The train back to Prague leaves every half hour. Go back to the train station, get on the train, and watch out the window as the fields turn back into buildings. The Local Explore Kit includes detailed maps and guide for a day trip from Prague to Čelákovice. Interested in staying the night in the small riverside Czech town of Čelákovice? My very good friend David operates a Bed and Breakfast (Pension). It is located in the centre of Čelákovice and right next to one of the best Czech restaurants I know. Čelákovice is a villiage with all emenities just outside of Prague. It take 25 minutes by train and 20 minutes buy car to get to the center of Prague. You will be right on the main square of Čelákovice. Restaurants, little grocery stores and the river are all nearby. 10 minute walk to trains station that takes you to the center of Prague. Train leaves every 30 minutes. Ideal for day trips into Prague. Newly renovated, fully furnished with modern amenities. Room for up to 5 people and kids are welcome. Most popular Čelákovice restaurant downstairs (also owned by David). Great Czech food! Close to river (Labe) and a river side walkway that takes you to the famous neighbour town of Stará Boleslav (famed for a major historical event - the murder of Prince Wenceslas by his brother Boleslav in the year 935). If you want to experience Czech people living their normal lives here is where you will see it. Expect to be the only tourists walking around Čelákovice. David speaks English and will gladly help you order and answer any questions you might have about Čelákovice or Prague once you arrive. Cost is 1500 CZK per night (approx $60 USD). Less if staying multiple nights. Contact me if you have any questions about staying over night in Čelákovice. And don't worry - I will make sure you find the place.